At least 23 people have been killed and 50 injured in a stampede during a clothes giveaway in Mymensingh city in northern Bangladesh, police say. Hundreds of people rushed through a small gate into a factory compound before dawn to get the free garments, causing a crush. Police have detained seven people, including the owner of the factory. 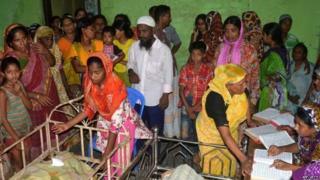 During the Muslim holy month of Ramadan, wealthy Bangladeshis often donate clothing to the poor. Police told AFP news agency that 1,500 people had gathered outside the chewing tobacco factory at about 04:45 local time (22:45 GMT Thursday) after the owners announced they would distribute free clothing, as zakat, or a charitable contribution. The stampede began when people tried to force their way in. Television pictures showed scenes of devastation, with hundreds of blood-spattered sandals lying at the factory gate. An injured woman told Reuters: "The moment the door opened, all the people all together rushed through the gate. "Many fell on the ground and others ran over them, and they died." Police officer Main Ul Haque said: "We have found 20 bodies, and the number will increase as many of the bodies were taken from the spot by their family members."